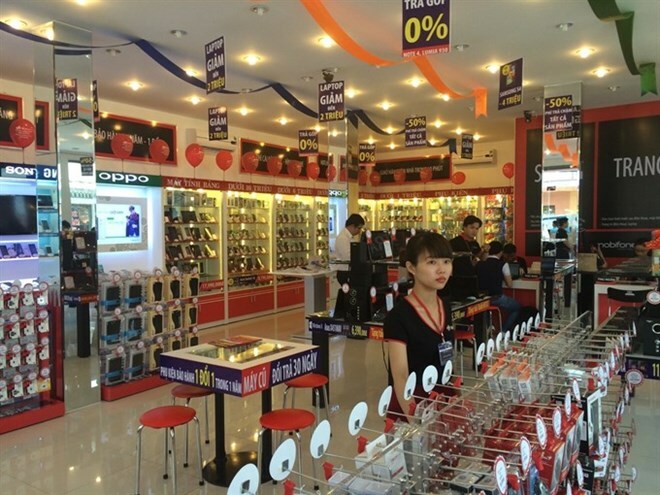 Hanoi (VNA) - Information technology group FPT Corporation (FPT) has announced it will reduce its ownership in its retail arm FPT Technology Production Distribution and Retail to below 50 percent. The group said in its management board’s resolution issued recently that the divestment will be carried in 2017 and divided into two stages. In the first stage, FPT will sell 30 percent to institutional investors to reduce its ownership to 55 percent from the current level of 85 percent. Secondly, FPT will sell a maximum of 10 percent of its remaining stake in the retail and distribution arm to other investors via an initial public offering (IPO). According to the Nikkei Asian Review, the sales of the distribution and retail arm could bring about 2.3-2.7 trillion VND (103-121 million USD) to the firm. The sale income could be used to improve its technological infrastructure and provide new telecommunication services. At the group’s annual shareholder meeting held in April, the group chairman Truong Gia Binh said selling the distribution and retail arm was a must so FPT could become a pure ICT group with rapid growth. HCM City Securities Corporation (HSC) said in a report that the deal could be finalised in the third quarter of this year. According to HSC, the IPO price has not been determined as FPT did not want its shares to be owned by a single investor, however, it could be lower than the share price of Mobile World Corporation. HSC also said that FPT Retail could trade on the HCM Stock Exchange (HOSE) in 2018. Shares of FPT, listed on the HOSE under code FPT, closed on August 2 up 0.8 percent at 49,400 VND per share. Shares of Mobile World Corp on the same exchange ended at 99,500 VND per share. FPT also plans to increase charter capital for FPT Software LLC to 1.3 trillion VND from the current 1 trillion VND, marking the group’s efforts to switch its core business from retail to technology and telecommunication. The group also announced it will make a 10-percent cash advance payment for 2017 dividend payout, meaning shareholders will receive 1,000 VND for every share. The group will finalise the list of beneficial shareholders on August 18 and payments will be made on August 31.